BATON ROUGE, La. (CNS) — Louisiana pro-life leaders praised state lawmakers and Gov. 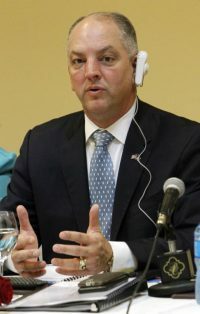 John Bel Edwards for passing a bill banning abortions after 15 weeks during the recently completed regular session of the Legislature. Edwards signed the bill into law May 30. It carries a prison sentence of up to two years for any medical professional who performs an abortion after 15 weeks. Also, women who elect to have abortions after 15 weeks would not face criminal charges. The bill would only take effect if a federal court and potentially the U.S. Supreme Court uphold a similar abortion law in Mississippi. The bill garnered overwhelming support in both chambers, originally sailing through the Senate by a 31-3 vote April 24. The House passed an amended bill May 15 by an 81-9 margin and the Senate concurred May 16 in a 24-1 vote. “The heart (of an unborn baby) is beating twice as fast as the mother’s, and especially with abortion that gruesomely crushes the body,” said Alexandra Seghers, the legislative liaison and youth program director with Louisiana Right to Life. Bill sponsor Sen. John Milkovich has been a strong pro-life advocate and said his bill is in an important first step to protect unborn children. “We thank and commend our pro-life governor for signing this bill and once again taking a stand for life,” Milkovich said. “Recognizing that really no woman grows up wanting to have an abortion, so how can help a woman who clearly is in crisis?” Van Haute said. Mississippi enacted its 15-week abortion ban in March but challenged immediately and put on hold by a federal judge. It faces what many expect to be an extended legal battle. Seghers said women facing an unwanted pregnancy do have the option of adoption, and said the Adoption Option Act “empowers women, especially in those instances where she may not feel ready to parent. Van Haute said the vote further cements Louisiana’s tradition of being the country’s strongest pro-life state. Louisiana and Mississippi would have the earliest abortion bans in the country if the law is ultimately upheld.